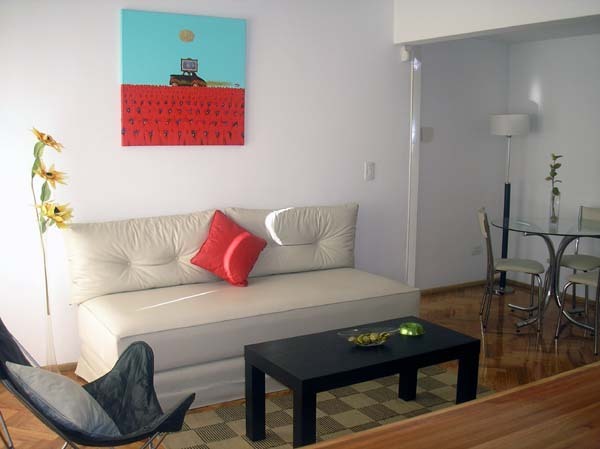 Very nice, modern and bright one bedroom apartment located in the Palermo Hollywood, surrounded by great restaurants, bars and shopping area. The apartment offers a large terrace-balcony, a living room with air conditioning, confortable sofa, dinning area with table and chairs. The fully equipped kitchen is open to the living room. The bedroom has a double bed, cable TV. The bathroom is complete with bathtub and shower. Large balcony-terrace. Nicely and modern furnished. Very bright, hardwood floor, air conditioning, heating. High Speed Internet. Fully equipped kitchen. Downtown, 3 blocks from metro station, bus stop, commercial area, residential area, bars, pubs, restaurants, coffe-shop, banks, exchange house.